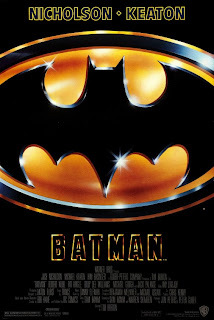 In the summer of 1989, Batman was all the rage, breaking box-office records (it was the first motion picture to cross the $100 million mark in its first 10 days) on its way to a worldwide gross of $414 million. But while many comic-book fans were undoubtedly lining up to see one of their favorite superheroes on the big screen, the movie’s villain proved just as strong a draw. Gotham City is abuzz with tales of a masked vigilante known as the Batman, who appears out of nowhere to foil criminals, then quickly disappears into the shadows. The identity of this caped crusader remains a mystery to all except two people: billionaire Bruce Wayne (Michael Keaton) and his butler (and longtime friend) Alfred (Michael Gough). You see, Bruce Wayne is Batman. His obsession with justice started years earlier, when, as a boy, he witnessed the murder of his parents. Now, he devotes his life to fighting crime, and relies on an assortment of gadgets and gizmos to assist him whenever his enigmatic alter-ego is on the prowl. On the other side of the coin is Jack Napier (Jack Nicholson) a gangster and the right-hand man of Carl Grissom (Jack Palance), the head of all organized crime in Gotham City. But Jack’s not happy playing second fiddle to the aging Grissom, and Grissom knows it. So, to rid himself of his ambitious cohort, he sends Jack on a mission that will likely spell his doom. But when Batman shows up on the scene, Jack instead falls into a vat of toxic waste, which changes his appearance (giving him green hair and bleached skin) and warps his mind. Now known as The Joker, Jack initiates a crime spree the likes of which the city has never seen before. Will Gotham’s self-proclaimed guardian bring an end to the Joker’s reign of terror, or has Batman finally met his match? Directed by Tim Burton, Batman is a dark film. The city of Gotham, with its dimly-lit streets and gothic architecture, is a grim, forbidding metropolis, a haven for criminals and a town where decent folk live in fear. In short, it’s the perfect place for the elusive Batman, a hero to some, a dangerous vigilante to others. In the film’s opening sequence, Batman surprises a couple of street thugs who’ve just robbed a family at gunpoint (the shot of Batman descending behind them is one of the movie’s most impressive images). When the dust settles, our hero has knocked one of the two out cold, and instructed the other to “tell all your friends about me”. As played by Keaton, Batman is an enigma, a puzzle many are trying to piece together, including reporter Alexander Knox (Robert Wuhl) and photojournalist Vicky Vale (Kim Basinger). Vale will get closer to the truth than she realizes when, after crashing a high-end party, she strikes up a romance with Bruce Wayne. Yet, through much of Batman, the movie’s title character remains a mystery. The villain, on the other hand, is like an open book, a criminal with a mean streak who, after his toxic bath, only gets meaner. Nicholson is at his anarchistic best as The Joker, tossing off puns one minute and acting psychotic the next. In the scene where, following his accident, he confronts Grissom, we see both sides of The Joker’s personality (after accusing his former boss of setting him up, he shoots Grissom in cold blood, then continues to fire as if he were aiming at targets in a carnival game, laughing as he does so). Along with getting all the film’s best lines (when Vicky Vale asks The Joker what he wants, he replies “My face on the one-dollar bill”), Nicholson steals the spotlight whenever he’s on-screen, delivering a performance that, while certainly outrageous, brings with it an energy that’s simply too compelling to ignore. The series continued its trend of casting superstars as Batman’s adversaries in the 1992 sequel, Batman Returns, upping the ante by giving us two baddies for the price of one: the Penguin (Danny DeVito) and Catwoman (Michelle Pfieffer). Yet while some of the sequels were entertaining (aside from Batman Returns, I have to confess that 1995’s Batman Forever is a guilty pleasure), none would match the original, which gave us both a hero and a villain we wouldn’t soon forget. I love the first Tim Burton Batman film. I've got some good memory's of watching this at the cinema and the fact my then Youngest little brother got in despite it being under the brand new 12 certificate at the time.To this day Michael Keaton is my favourite of all that have played Batman. He has the right amount of Bruce and Batman going for me and he under plays the role so well I think it's a shame we never got to see him in Batman Forever. Did you know Bill Murray had been rumoured to be cast in the role at the timeI've always thought Jack Nicholson's Joker was OK but I think the man ruins it himself by just being far too... not sure what the word is to be honest. I don't like how Nicholson's name was billed before Keaton's ether. In fact this film might of been a bit better if it had not had his ego all over it.The Bat suit is fantastic and this also is my favourite of the costumes that have been designed from the original films. Although I find it amusing to read some people wanted to use a Nike product placement on it. Maybe the famous tick could of gone in the middle of the bat symbol?Danny Elfman's theme is still a top five movie tune for me to this day. And I'll openly admit to loving the Prince soundtrack.Great film.